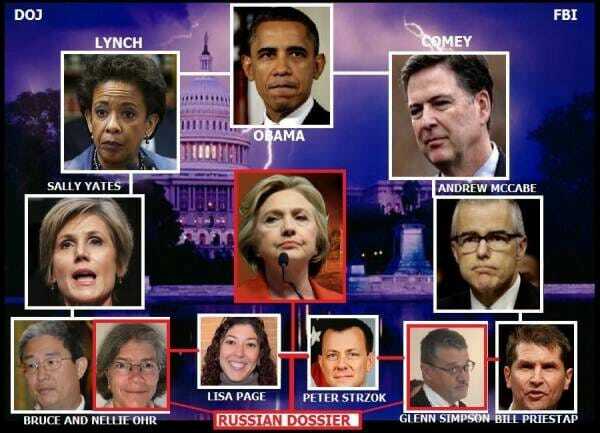 The SAME DEEP STATE Team that spied on Donald Trump’s Transition Team and worked to exonerate Crooked Hillary Clinton in the sham email investigation is now working to impede, block, delay, lie, deflect from any Congressional investigator sniffing out their trail of crimes. The Last Refuge at Conservative Treehouse put together this string of very important findings regarding the unlawful spying on the Trump Campaign, the Trump Transition Team and the Trump administration by the deep state apparatus. 4. Q’s: A) What reason would Van Grack have for taking the call from the transition attorney in the first place? and then, B) what reason would he have for lying about the information that was requested? 5. It is my belief, based on mounting evidence, a specific cast of characters -within the Mueller “Russia Election Interference” probe- were placed there to protect the people behind the FBI’s 2016 counterintelligence operation against Trump. 7. That same “small group” within the FBI and DOJ were then given the task in 2017 of covering both prior operations: A) *Clear Hillary Clinton, and B) *Counterintel op on Trump. 9. Inside Mueller’s crew, the “small group” essentially works to watch over what information the Trump officials or congress could possibly be discovering…. under the auspices of investigating ‘Muh Russia’ etc. 11. That’s why the Special Counsel attorney that signed General Flynn’s Statement of Offense filed Dec. 1, was the same attorney who responded to the Trump transition team inquiry. Brandon L Van Grack. 13. It is very important that @BarbaraRedgate and @GenFlynn , along with all those who search carefully for the truth, pay attention to these names contained on these documents. It is essentially a repeating pattern of the same people. 14. I hope that makes sense to everyone. In October we at the TGP suspected that the Mueller team was destroying evidence and the bogus crime on President Trump that is not a crime in an investigation that is not constitutional, was just a front for the ability to destroy evidence. It looks like we are getting closer and closer to the rotten core of deep state and they are doing whatever they can to deflect, lie, deceive and block the investigators. Sean Hannity said this was just the beginning. It appears Sean was right. Previous article CNN Fawns Over Kim Jong Un’s Sister – Then The Twitter Bashing Began! What Christopher Steele Admitted In Court Should Have Hillary, Mueller, And The Rest Of Their Goons Locked-Up NOW! Special Counsel’s Evidence Should Be DECLASSIFIED NOW – Hillary’s Fingerprints Will Be Found All Over The Russian Witch Hunt! CNN Fawns Over Kim Jong Un’s Sister – Then The Twitter Bashing Began!